Republican Party supporters -- this is REALLY bad . Hawaii's GOP State Chair Fritz Rohlfing has just blown ALL of the party's monies raised in recent fundraisers with a single bad decision. . . a decision made in secret and supported by his co-conspirators on the state party's executive committee. The decision? To award a salary and perks of more than $120,000, over two years, to the least politically experienced person in the State of Hawaii or elsewhere. Yes, you read that correctly ; Fritz Rohlfing has ratcheted up his fiduciary recklessness by secretly hiring an absolute neophyte as the party's new executive director. It is a travesty and an embarrassment to have this person pretend to be qualified as the top political operative and strategist in the islands upon whom the electoral future of the Hawaii Republican Party (HRP) rests between now and the 2016 general election. 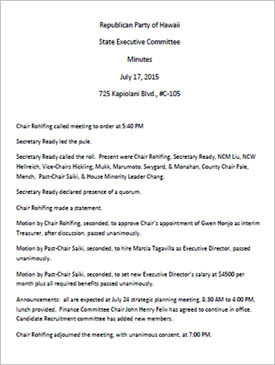 Previously unpublished draft minutes of HRP's secret 'Executive Committee' meeting held exactly one month ago reveal that top party leaders -- including Fritz Rohlfing, Pat Saiki, Miriam Hellreich, Beth Fukumoto, Ted Liu and others -- voted unanimously behind closed doors to take all of the money the party made from the last Lincoln Day Dinner ( and a lot more ) totalling $120,000+ and give those proceeds to just ONE PERSON: Marcia Tagavilla , whose extremely thin resume in no way screams out either "political strategist" or "big time campaign fundraiser" or "statewide coordinator" or anything else. Read Tagavilla's thin resume for yourself HERE. Her skimpy curricula vitae shows that she's only ever briefly had one job ( working at a charter school in Waianae from 2012 to 2014 ) since finishing high school. Shortly after volunteering for a position alongside Rohlfing as Secretary of the Honolulu County GOP in 2013, she then bailed on that commitment to the party. 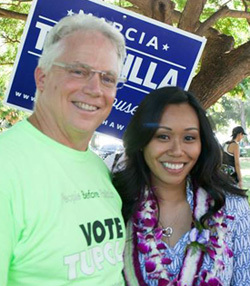 In 2014, Tagavilla suddenly returned from nowhere as a last-minute candidate for state house and got clobbered more than two to one ( 66% for Democrat Linda Ichiyama and 33% to Ms. Tagavilla ). And that is who Fritz Rohlfing and his misguided buddies have decided to empty the party's bank account of more than $120,000 for in order to entrust the entire future of the Republican Party and its uphill battle in Hawaii. HRP cannot possibly justify this reckless and irresponsible hiring decision, the money, or the process involved. First of all, how can our state party already mismanaged by Rohlfing, Hellreich and Liu which was only able to raise $2,300 in June afford the cost of throwing so much money for such an unqualified individual at a pricetag of more than $5,000 per month for the next two years ? That's more money than the party even gave to candidates during the entire 2013-2014 election cycle for all Republican campaigns combined . More importantly, while Tagavilla is probably a really nice person, let's get back to the simple math: Tagavilla will be paid more than the party has raised in a month . There just isn't enough money left over from paying the expenses related to the party's costly Honolulu headquarters to cover this astronomical payroll for a party which has been deficit spending (i.e. creating debt like Democrats) for the better part of the past few years. Second, if Rohlfing and party leaders were really trying to fill the top executive position at the Hawaii Republican Party with the best possible candidate, then why did they refuse to publicly or even privately advertise the position , why did they refuse to perform an executive search , and why did they refuse to perform any vetting ? Clearly, Fritz Rohlfing was NOT even trying to get someone qualified when he raided the party's bank account for such a large and unjustifiable sum . Third, the arbitrary and extravagant salary for Ms. Tagavilla is by no means commensurate with her paltry experience , especially when you consider what the party has paid others in the recent past. 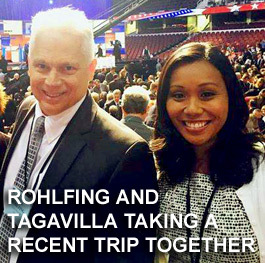 Rohlfing is paying his young friend and crony Tagavilla MORE money by far than previous executive directors . . . all of whom had MORE political experience. Just during the past three months, Rohlfing has gone through THREE different executive directors: Blake Parsons, Erin Fale, and now Marcia Tagavilla. 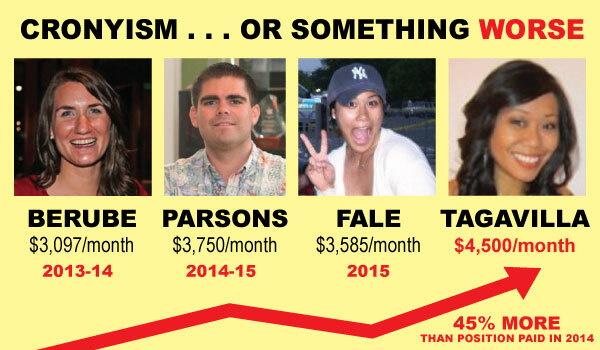 Parsons was paid $3,750, Fale was paid $3,585, and Tagavilla will receive $4,500 plus perks . Prior to mainlander Parsons was mainlander Kayla Berube, who was even more experienced than Tagavilla's two predecessors . . . and she only got paid $3,097 per month. So the least experienced person will receive a LOT more than her experienced predecessors . This falls right in line with Democrat welfare ideology. Fourth, take a close look at Tagavilla's severely lacking work experience . Not only does she lack previous job experience in this industry, Tagavilla has held only one paying job since finishing high school : less than two years working at a charter school in Waianae. THAT'S IT!!! Who gets paid $120,000 for a two year political campaign with such a thin resume??? And who are the grownups making such terrible spending decisions? Even in the first year alone, Tagavilla's $60,000+ is more than half the federal money the party raised the entire six months of 2015 (a paltry $110,000). You don't need a pocket calculator to figure out the serious math problem with Rohlfing's salary equation of giving upper management wages to an entry-level hire. So exactly how does 'hiring' the least experienced person imaginable for a supposed 'job' as the top paid executive director position at Hawaii GOP headquarters make any sense when that job should naturally be offered to the highest quality political operative the state party could possibly attract? Is this a case of cronyism run amok, or is something worse going on? NONE of this makes any sense , unless party leaders want Democrats to keep winning . And that seems to be the case. Party leaders are trying to destroy the Hawaii GOP by acting this way . Our party is too small, too underfunded, and too far behind Democrats to let more than a hundred thousand dollars go down the drain by overpaying someone with virtually zero experience, in work, politics or even life. Let's get down to brass tacks. What can YOU do to help right our party's direction?? DON'T CONTRIBUTE A PENNY TO THE SCANDAL-RIDDEN HRP . . .
. . . not until this scandal is over and not until certain key conditions*** are met by party leaders.
. . . donate directly to deserving Republican candidates instead. *** For the good of the Hawaii Republican Party and for all Republicans in the state, this laughable and nonsensical job offer to Marcia Tagavilla must be rescinded and all party leaders on the HRP executive committee should resign effective immediately. We now know that Rohlfing, Hellreich, Saiki and the rest are willing to flush our party's money down the drain. There isn't much time between now and Election Day 2016 left to install new party leaders who can lead this volunteer organization and its candidates to greatness. Join HIRA in sending a message to party leaders that throwing good money after bad is what Democrats do, NOT real Republicans. For now, put down your checkbook and put away your pen. Fritz Rohlfing, Pat Saiki and Miriam Hellreich are making the kind of terrible decisions that would only make President Obama, Governor Ige and Mayor Caldwell happy. 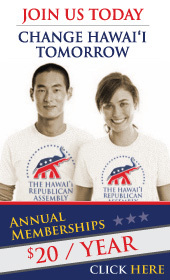 If you're interested in belonging to a Republican organization in Hawaii which always speaks out for conservative solutions and against liberal idiocy, then consider becoming a member of the Hawaii Republican Assembly (HIRA).